Benefits of Tea for health, weight loss or detox. Instead of water you can enjoy the benefits of tea. We are always hearing how much water we should consume daily. Perhaps we can spruce up that glass of water by making it a delicious beverage that has added health benefits that are pretty much calorie free. According to legend, tea was first discovered in China in 2737 BC. Since then not only has it become an everyday enjoyed beverage but certain varieties have been brewed to cure or aid a number of ailments. Though there are many varieties, all tea comes from the same plant called the Camellia sinensis, they are just processed a little differently. The only exception to this would be some herbal infusions. Today, countless studies have shown that the benefits of tea can help or prevent certain health conditions. Just to list of few are obesity, improve liver function, stress, cancer, heart disease and rheumatoid arthritis. *Originated in China over 4000 years ago. It has a mild flavor and is green in appearance. Green tea contains catechin polyphenols and EGCG (Epigallocatechin gallate). These powerful antioxidants are what give it the ability to help in so many areas of our health. In terms of weight loss the high levels of catechin polyphenols increase levels of fat oxidation and thermogenesis (a process within the body which increases metabolism and burns fat as fuel). Oolong tea contains polyphenols which is an antioxidant. It helps protect cells from free radicals preventing possible illness or disease. Another beneficial quality polyphenols is believed to have is the way it increases metabolism which helps in weight loss. 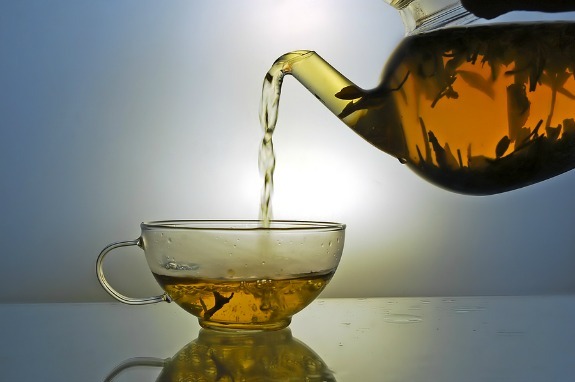 In recent years this tea has become extremely popular for the purpose of weight loss. Even stars like Oprah are known to drink it. * White tea is light in color and has a delicate taste. The tea consists of younger buds of the plant that are not fully opened and have silvery white fuzz on them. This is what makes them white in appearance, hence the name, white tea. White tea goes through the least amount of processing and is considered the purest form of tea. Since processing is minimal this tea contains high levels of antioxidants and helps detox your body. *Is the most popular amongst consumers and offers a rich robust flavor. Black tea is originally green tea but the leaves are dried for a longer period of time and then fired to seal in flavor and aroma. Black teas contain flavonoids which help reduce the production of LDL – which is the bad cholesterol that can lead to stroke and heart attacks. Studies have shown improved blood vessel function and regular consumption can reduce the risk of coronary heart disease. Herbal teas differ from the ones mentioned above as they do not come from the Camellia sinensis bush. These teas or herbal infusions typically contain dried fruits, flowers and herbs. These teas can also be referred to as herbal infusions or tisanes. The knowledge of tea is inspiring and there are so many flavors to choose from. Come join us and become a tea toddler too. You can sip a cup of the good stuff to help battle weight loss, insomnia, anxiety, stress, digestive issues, or other medical conditions. There is a plethora of teas to choose from now a days. So take the time to investigate all the choices and start enjoying the pleasures and benefits that tea has to offer.